Goat Milk Stuff debuted an assortment of Holiday Gift Packs designed for lavish spa-like pampering with the finest all-natural goat milk soaps, lotions, bath fizzies and scented soy candles to clean and moisturize skin while indulging the senses at sensible prices. “The holidays are an important time to exchange gifts that show you care and we feel that our our Goat Milk Stuff gift packs are a wonderful way to share your feelings,” said PJ Jonas, who founded Goat Milk Stuff on her family’s small Indiana farm. Customer comments on the Goat Milk Stuff website, GoatMilkStuff.com, attest to benefits of the high quality luxurious and affordable products that benefit skin. Oprah Magazine and the NBC’s Today Show, at tinyurl.com/cjcmgc3, both showcased Jonas family and its products. White Gift Box at $45 is doubly deluxe with two bars of silky smooth goat milk soap, two small body lotion sticks, two moisturizing lip balms and two small bubbly bath fizzies elegantly wrapped with a red ribbon and bow. Red Gift Box topped with white ribbon and bow at $40 features a tub of 15 heart-shaped sugar scrubs that gently exfoliate with sugar and moisturize with shea butter while naturally cleaning, along with a bar of goat milk soap, body lotion stick, lip balm and small bath fizzy. Beauty Pack for $20 has a choice of three half bars of goat milk soap, a lotion stick and lip balm in a colorful organza bag. Bath Fizzy Variety Gift Pack at $20 contains six two-ounce bath fizzies as each will fizz and release soothing oils and scents into bath water in aromas of Black Raspberry, Cold Relief, Lavender, Luv Spell, Pink Sugary and Oatmeal-Milk-Honey, individually wrapped in organza bags. Foot Care Gift Pack at $18 includes a peppermint essential oil fizzy foot bath, peppermint luffa goat milk soap to exfoliate and peppermint lotion stick to moisturize. 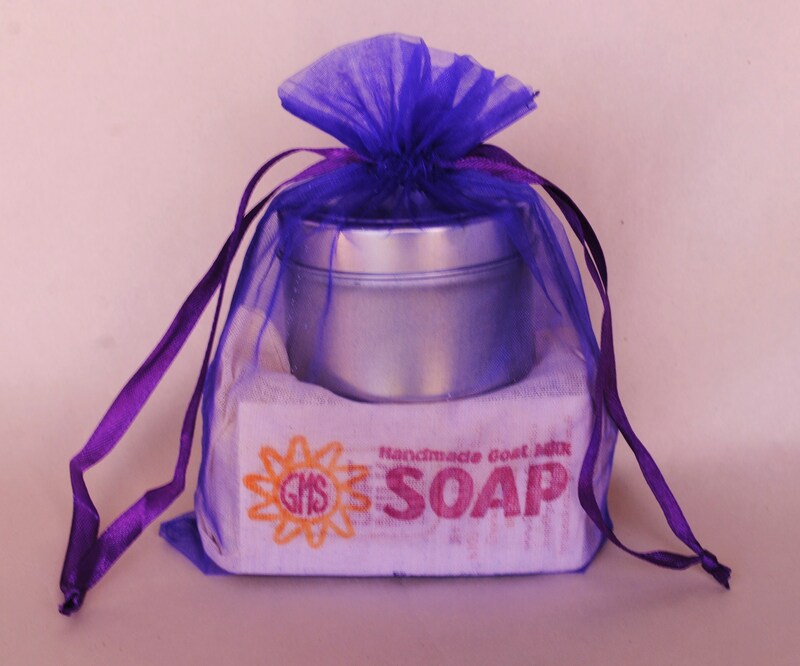 Twin Pack at $13 offers matching-scent goat milk soap and lotion stick in an organza bag. Scent Pack for $12.50 offers goat milk soap and soy candle in matching scents. Bath Pack for $12 has a bar of goat milk soap and two small bath fizzies in matching fragrance presented in an organza bag. Select Gift Pack for $12 allows a choice of three half bars of goat milk soap in an organza bag. The Holiday Gift Packs are shipped at very reasonable rates and arrive ready for presentation. Please refer to GoatMilkStuff.com to read about what consumers think of the soaps, lotions and more as the word-of-mouth success of the company continues to grow. 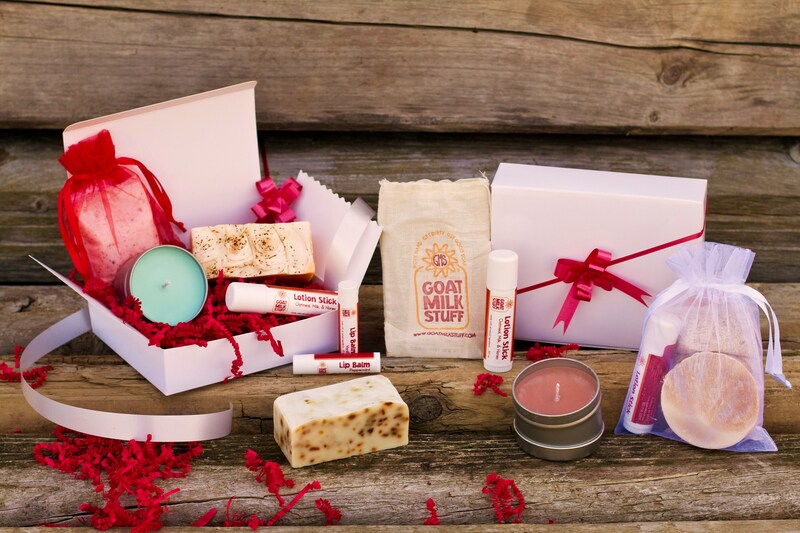 Online at http://www.GoatMilkStuff.com, the Charlestown, Indiana company and makes and markets all-natural Goat Milk Stuff™ products including goat milk soaps, lip balms, lotions, bath bombs, laundry soap, soy candles and more. For media contact Brian Dobson at DobsonPR.com or BD (at) DobsonPR.com. 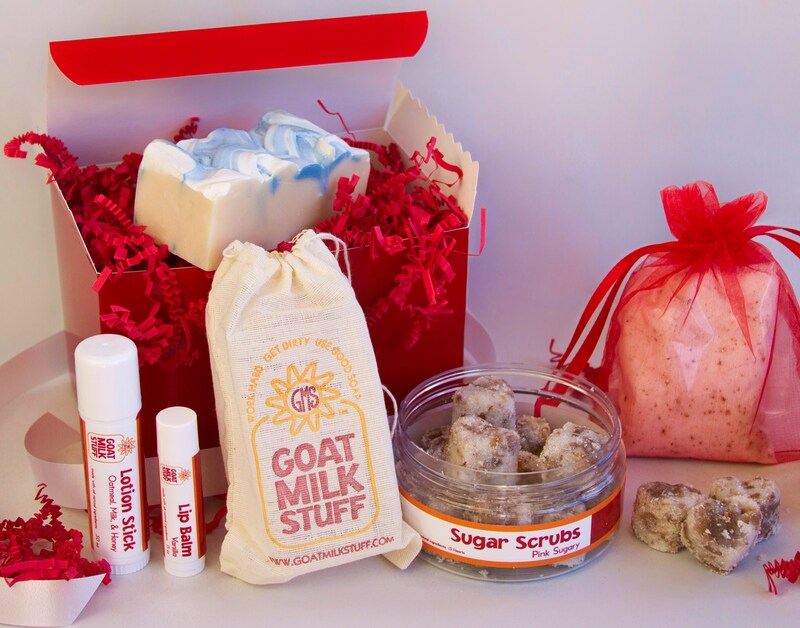 Goat Milk Stuff's Red Gift Box has heart-shaped sugar scrubs to gently exfoliate, goat milk soap, lotion, lip balm & bath fizzy. A variety of Goat Milk Stuff Holiday Gift Packs are available online at GoatMilkStuff.com. Goat Milk Stuff's Scent Pack has goat milk soap & soy candle in matching scents. The fragrant soy candle is in a travel tin. 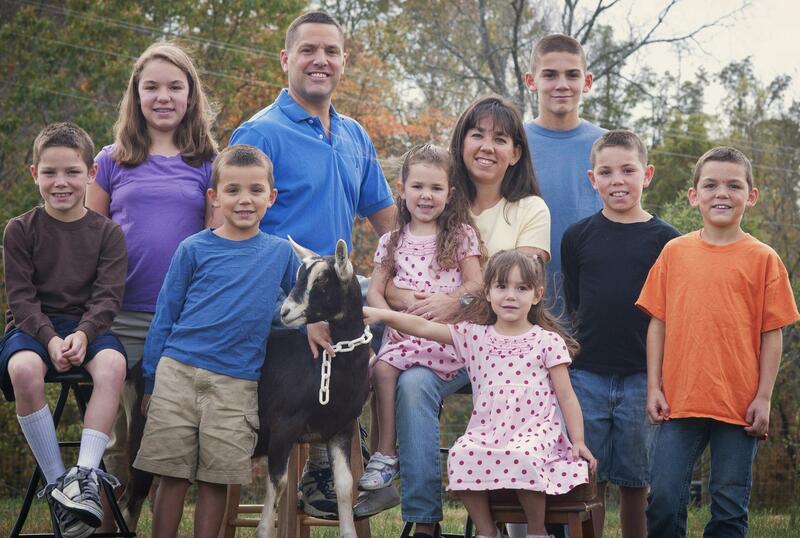 PJ and Jim Jonas and their 8 children make the finest goat milk soaps, lotions and other Goat Milk Stuff products on their Indiana farm.